Last week I rather overzealously predicted five killings in this week’s episode. While my prediction was certainly way off, the emotional weight of losing the two characters that we did certainly felt like five. While the death of Hodor was soul-crushing to say the least, it didn’t have much of an impact on the overall scoring. 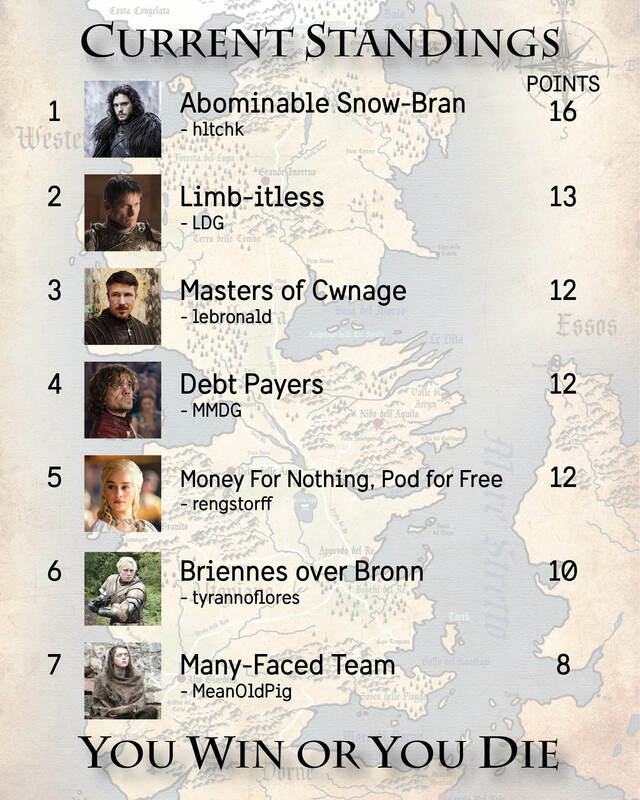 It was Hodor’s first appearance since we began so MMDG only lost out on one point. The real shakeup came courtesy of the Night’s King himself. Tyranofloresrex’s team got right back in the action with that huge kill of the Three-Eyed Raven. With the Night’s King getting the Kill Point and stealing all of the Raven’s Appearance Points, we are now starting to feel the brutal weight of important characters being killed off by other important characters. It’s also likely we could have seen the last of a few characters for a while. Dany’s touching demand of Jorah to find a cure for himself could mean he might be out for the season, while Dolorous Edd holds down the Night’s Watch so the rest of the Wall party can go build themselves an army. It’s MeanOldPig’s second death in three weeks, and while his gallows artwork was a fitting tribute to Ser Alliser, his Three-Eyed Raven has now officially set the bar for what we should be expecting after these deaths. MMDG’s “Hold the Door” tat just pours salt in the Hodor-sized wound in our collective heart.